Directions in European modernism and their echoes between the wars in Albanian literature or The bloody sense of retrieval is the description and deciphering, in a interdisciplinary key, of a birth metaphor belonging to a modern literature in Eastern Europe, or the act of exchanging of an archaic oral literature in Europe. This act involves a double movement of seduction-rejection: a blast stretching from east to Europe (which crystallize a tradition), and a stretch – intuitive and thirsty of specific and exoticism – of Europe to east. This paper studies the communication between East and West, in imagological, semiotic and cultural terms, using illustrative examples of European modernism directions (with an already universal impact) and the most interesting and rich period of Albanian literature (for several reasons unknown, primarily due to the fact that the Albanian language is not a language of global communication). Beyond the differences and inconsistencies in time, East - West relationship, of linguistically and culturally point of view reveals communion and certain trends on approach and retrieval. ·Chaos nourishment. Requirement of myths. Updating myths; how much sounds like a demythisation. Intelect poetics. Fan Noli, from Peter's denial, to the ancient marathoner. Moses is born in the time of Moses. ·Heartbreaking feeling of Innocence, and of God's eternal Childhood. Paul Claudel. Oblivion: an empowerment to conquer all possible lives. "To give you life as you were born." Gjergj Fishta. Through Christianity, romance, Hellenism – to a communion with Eden. Poetry, a self-expression of God (Paul Claudel and Gjergj Fishta). In conclusion, the differences in these two spiritual spaces essentially do not go beyond the boundary of aesthetic and terminology. If Europe would have been subjugated entirely by the spiritual desert, cultural exiles of the East would be able to save their artistic identity, to explain the existence of past – and viceversa. We deal with two spaces, which always tend to live each other specifics, eventually eliminating at the end, although sometimes with delays, any arrogance and / or ephemeral vanities and geopolitical rigidities. Between these two areas, however, lies a God – in the knot that connects and separates the two final options – position which decides the future communication between both European spaces. 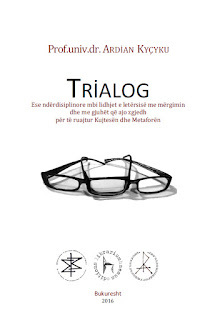 Note: Following this PhD thesis, the following studies appeared: "God minor imitator" (monografy, Romanian University Press, Timisoara 2000, ISBN: 973-8063-02-7) and "Patenting of insomnia" (extensive afterword to the anthology "The beauty that kills" (modern Albanian prose, in Romanian, Publisher Librarium Haemus, Bucharest, 2006, 195 p., ISBN: (10) 973-87952-3-0, (13) 978-973-87952-3-5). After years of research and meditation, under individual initiative SEMIOTICON BALCANIC, taking ideas and fragments of volumes above, with revisions, updates and additions, I have prepared and are forthcoming the following volumes: „Rara avis” – literary Study, imagological and semiotic of the life and work of the European lyrical Albanian Lasgush Poradeci, Publisher Librarium Haemus, digital edition, ISBN: 978-606-8093-64-2, şi "Outism and insomnia"– An imagological and semiotic study about some Albanians authors of literary expression, ISBN: 978-606-8093-65-9.